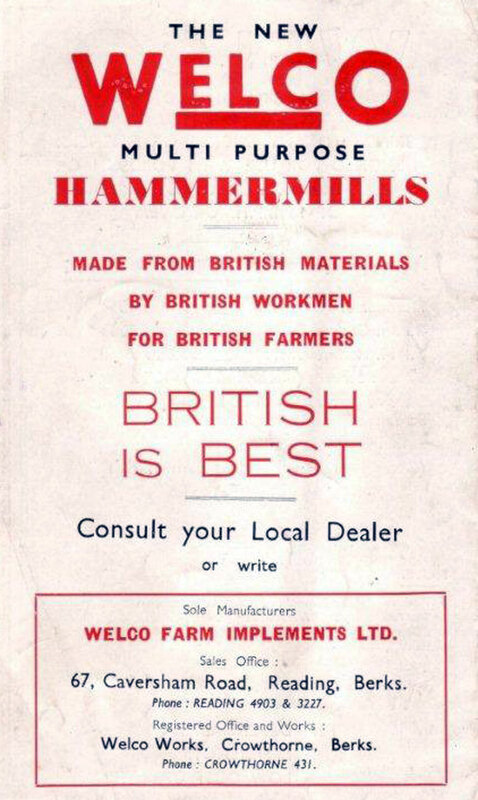 C. D. F. Buckler ran the agricultral engineering company called Welco Farm Implements Ltd. The Welco company was founded by Mr. Wells at a date unknown and the business was transferred to Buckler probably in the early 1940's but ceased production in the early 1950's when the factory was converted to produce Buckler sports cars. Welco spares continued to be available from the Buckler company into the 1960's. Welco also made hand implements including a hoe with wheel. The WELCO hammermill had a heavy and durable cast iron casing with the name WELCO in large relief letters being part of the casting, therefore any left out in the weather may still be readily identifiable. 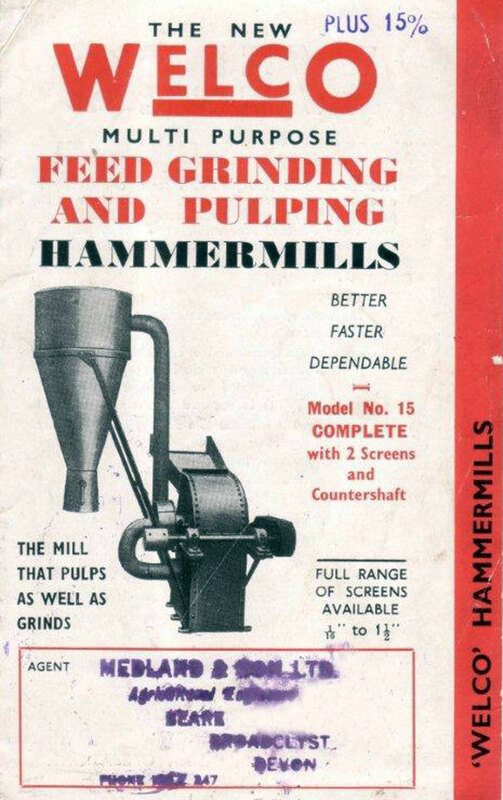 It had 40 revolving heat treated hammers retained by aircraft quality high tensile bolts. These were operated by a shaft revolving at 3,000 to 4,000 r.p.m. Energy absorbed was from 12 to 15 horsepower and the mill could be driven by any power source but was particularly suited to tractor power. It was designed to grind pulp or mash to almost any degree determined by the selection of perforated screens available from 1/16inch to 1 inch mesh. Depending on the material crushed, the output was about 20 to 30 cwt per hour. A robust fan blew the material into a twin bagging attachment. These mills were mostly used for dealing with cereals, clover, mangolds, potatoes, oatcake, bones for bonemeal, dried chalk, fertilisers and other chemical and mineral materials. This page was last edited on 10 June 2017, at 07:58.